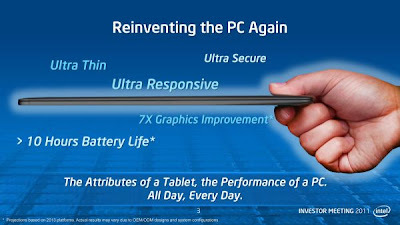 WiggleDoodle: Thin and Light Laptop: It's the Ultrabook! Thin and Light Laptop: It's the Ultrabook! I recently came upon a report that Intel has created a seed fund amounting to a whooping US$300 million to push a new class of laptops to PC makers. 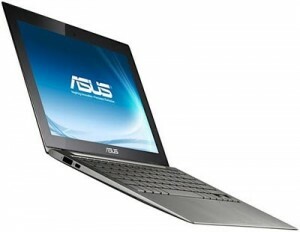 These new machines are supporsed to be thin, light and ultraportable that's why they're called the Ultrabooks. The chip maker wants PC makers to come up with laptops that are a mere 0.8 inch thick, have a long battery life and should sell at less than $1000. In short, I bet you're thinking what I'm thinking, a Macbook Air killer. For some, it's not only the MacBook Air that this new gadget could me meeting head on but also the iPad and the other tablets out there. It seems the PC people are still smarting over the death of netbooks brought about by the pads and tablets. The Ultrabook seemed to be focused on those who want to do more with their tablet but does not want the heft and weight of a laptop. Intel wants the Ultrabook to have the instant on capability of the iPad (which the new MacBook Air already has) as well as the ability to update its software via the cloud anytime. By the way, it also doesn't come with an optical disk drive, just like the MacBook Air. So far, four manufacturers, Acer, Toshiba, Lenovo and Asus, have announced that they would come out with their ultrabooks later this year. The others seem to be reluctant to join the bandwagon due to fear of low consumer demand. The four manufactures that have joined the movement so far are coming out with units with prices in the range of $700 to more than $1,000. That's almost the same price as the MacBook Air! Also, why would they want consumers to say, "Oh, there's a new laptop and it's like a MacBook Air that runs on Windows!" instead of "Oh, there's a new laptop and it's great."? Just asking. Would you buy a wooden iPad or a paper laptop?